We can all appreciate seasonal food that doesn't quite get finished and somehow ends up buried deep in the refrigerator, so is this month's pet the result of a forgotten holiday meal? We're covering Lil' Leftovers! Lil' Leftovers is a battle pet referencing a comic by Cadistra. This pet is crafted with the Cooking profession. A specific skill level is not required; it is simply a rare drop while cooking any Draenor recipe. 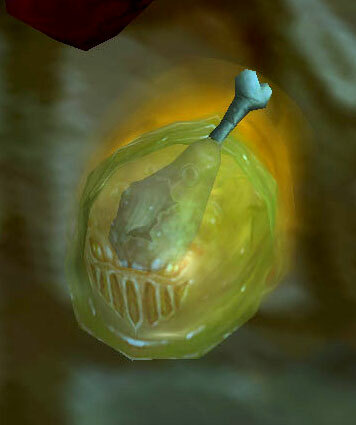 Many of these recipes can only be discovered by cooking other Draenor food. To begin your cooking adventures, you'll need to pick up The Joy of Draenor Cooking. This can be tricky as it's a random drop from creatures in Draenor. Once you've learned the item, just start cooking the new recipes! Better stock up on materials though, since this pet has a low drop chance. Using a Chef's Hat can help speed up the cooking process. Lil' Leftovers, being technically food, will not eat any pet treats such as Magical Mini-Treats or Magical Pet Biscuits. An error message will pop up, "Food cannot eat food." How apt! Lil' Leftovers is a battler as quirky as its flavor would indicate. Every one of its abilities has a twist. It has reflexive healing Absorb as its only filler offense move. Chew is its only other offense move, but its every-other nature makes it a bit tough to use in practice. Adding to the conundrum, the two offensive moves share a slot. The rest of the moves Lil' Leftovers uses could be classified as support or control moves. The two moves in its second slot both mitigate incoming damage. Crouch halves all incoming damage for 3 turns, while Stench reduces the entire enemy’s hit chance by 25%. This also potentially reduces incoming damage, but is less controllable. The last slot features two quirky moves. Food Coma (pictured above) is a relatively straightforward sleep effect. High Fiber removes all buffs and debuffs from Lil' Leftovers, which can be a bit tricky to manage, but might be just the trick against a pet that likes to apply DoT damage or a multiplier. Lil' Leftovers might not be the very first pet you’d think to put on your team, but will faithfully be there every time you open the fridge (whether you’d like it to be or not). I cooked for most of my time during WoD up until I un-subbed after 14 months of playing and this pet never dropped. In the end had to buy him off of the AH! So it's a classical RNG situation since I had guildies get him after only a few tries and others, like me, who never got him at all.